SCALE-UP is an integrated learning environment where the physical space is designed to discourage lecture and facilitate interactions between small groups working on short, interesting tasks: Hands-on activities, questions, simulations, or laboratories. 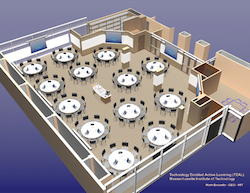 SCALE-UP classrooms often look more like a restaurant than a lecture hall. Because these classrooms are so different from traditional classroom settings, designing a SCALE-UP classroom can be a challenge. This recommendation will answer common questions about the main features that need to be designed in a SCALE-UP classroom. 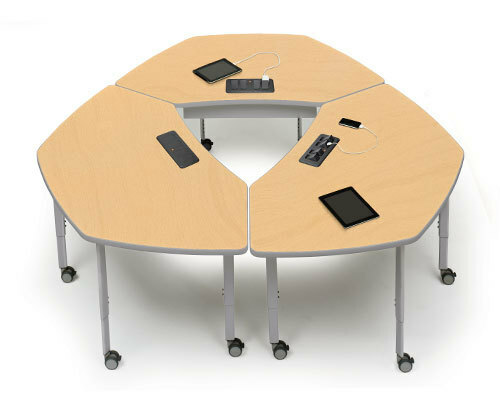 7-foot round tables with 3 groups of 3 students are the ideal size for fitting the largest number of students in a large classroom while still giving students adequate space and making it easy for all students to talk to each other. With these tables, you can fit about the same number of students in a space as you can when the students are seated in rows for traditional lecture. Smaller tables with the same number of students can work, but students don't have quite enough room for their stuff and can feel cramped. Smaller tables with fewer number of students work well for group interactions, but take up more space per student. 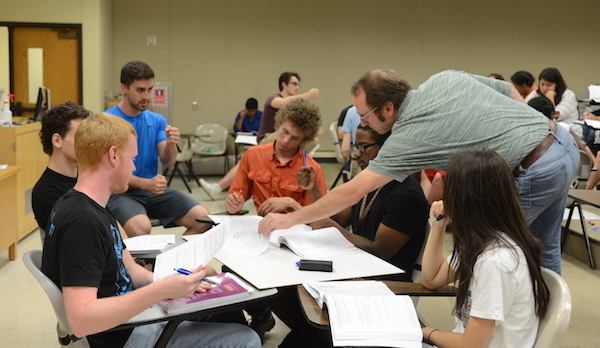 With larger tables, students have a hard time hearing each other across the table. A major disadvantage is that 7 feet is a non-standard size and therefore difficult to find and expensive. *We are not endorsing any of these products. Note that list prices are usually heavily discounted. You can build your own 7-foot tables for less than a third of the cost of buying them. For detailed directions, see the Expert Recommendation on building SCALE-UP tables by Bill Nettles. 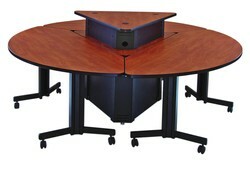 6-foot round tables are a standard size for restaurants and conference rooms, so they are easy to find and cheap. This size is not ideal because students don't have quite enough room for their stuff and can feel cramped. 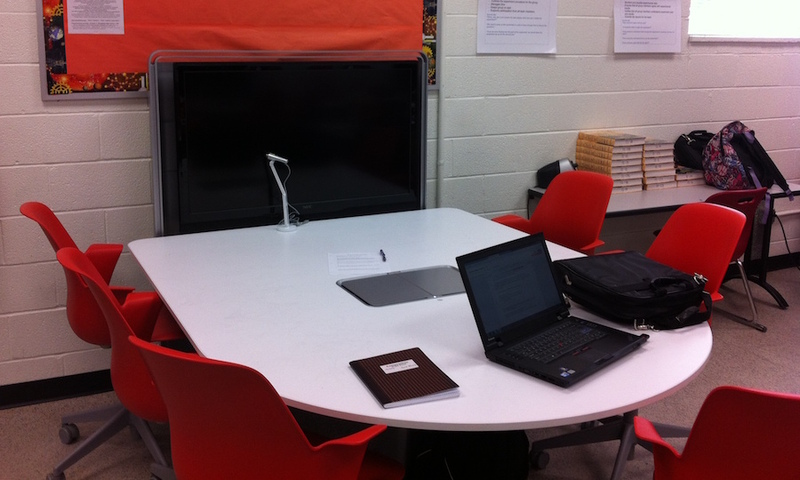 However, many implementers have found that they can get by with 6-foot tables with 3 groups of 3 students. If you are on a budget, these are better than many alternatives. Some institutions have even found deals on used tables from hotels that were remodeling. 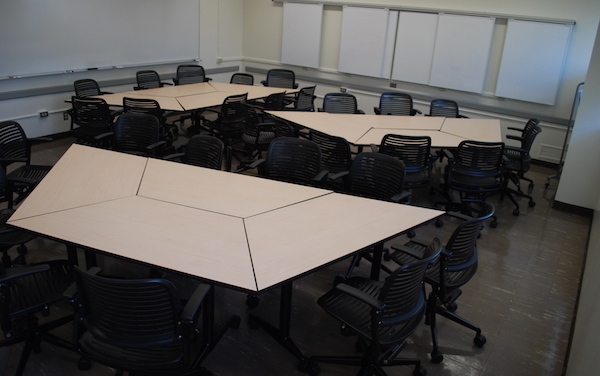 If you already have a room with small trapezoidal tables, you can create a SCALE-UP room at zero cost by rearranging them into hexagonal tables with 2 groups of 3 students. This works well for group interactions, but you can't fit as many students in the same space. 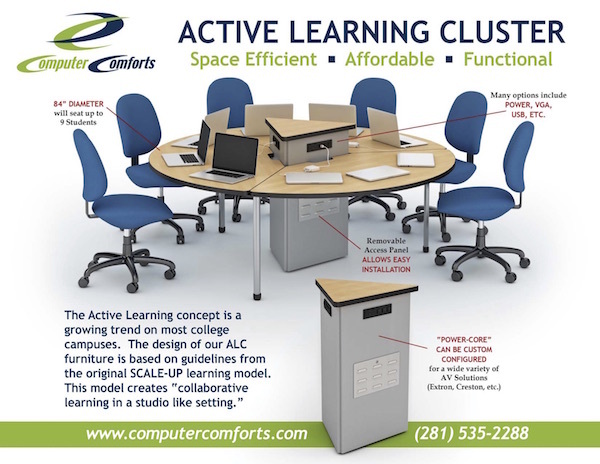 In smaller classrooms, you can use wall space effectively by lining the walls with D-shaped tables, with 2 groups of 3 students sitting around the curved edge, and the flat edge against the wall with a large screen above it. 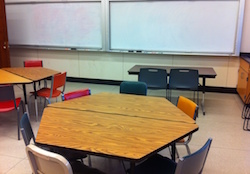 A 5' square table adjacent to a 5' diameter half-circle table will seat six students comfortably. A thin 42" screen can be seen across the room by occupants of other tables. This works well if the room is small enough that you only need two tables across it, and all students can easily see each other's screens. One advantage of this setup is that it allows students to just look around the room to see each other's work, so you don't have to pay for expensive screen-sharing equipment. If each group has their own set of large lab equipment, it's difficult to fit all the equipment for 3 groups around the 7-foot tables used in a standard SCALE-UP classroom. 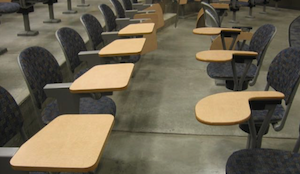 X- or T-shaped tables are a variation on D-shaped tables where the computer monitor is at the junction of the X or T and one group of 3 students sits around each leg. 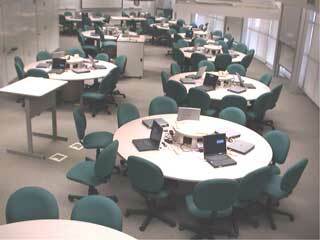 These tables provide adequate space for each group to have their own lab equipment. 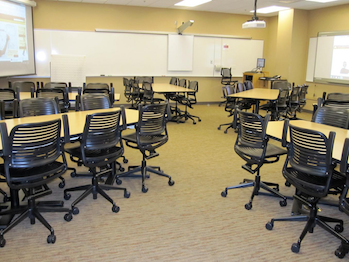 Unlike with round tables, students are not automatically facing all the other students at their tables, so swivel chairs are helpful for encouraging inter-group interactions. 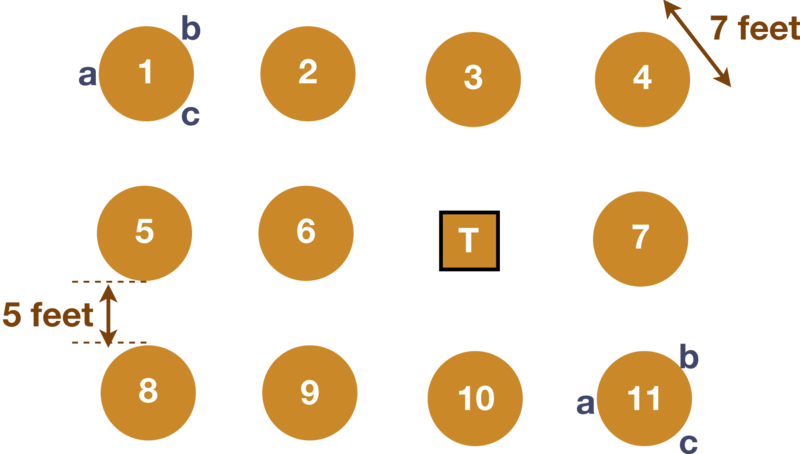 Rectangular and trapezoidal tables don't work as well because it is harder to configure them so that all members of a group can face towards each other and multiple groups can interact. However, many implementers have made SCALE-UP work with awkward table configurations. It is possible, and better than nothing, to make SCALE-UP work with rectangular tables, but not ideal. Beichner initially experimented with putting 4 groups of 3 students around 9 or 10-foot round tables. However, he found that these tables didn't work well because students were too spread out and couldn't hear each other. Try to arrange the tables so that students anywhere in the room can see anywhere else in the room. You should have at least 5 feet between table edges (12' center to center table separation). Things get very crowded if you place them any closer. Using seats with thin backs, rather than thick upholstery, gives you a bit wider walking path between adjacent tables. If there is an instructor podium, it should be in the middle of the room rather than on one side. 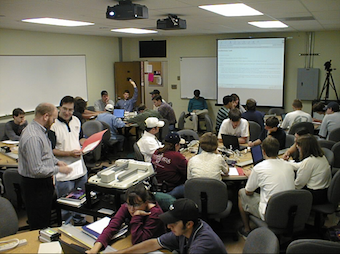 Putting the instructor in the "front" of the room creates the expectation of lecturing (in the minds of both the students and the instructor). 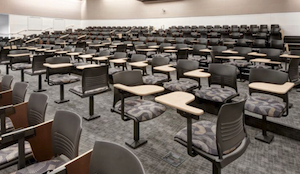 North Carolina State University has created sample layouts for SCALE-UP classrooms for 27, 36, 45, 72, 99, and 135 students. are a critical tool for collaboration in a SCALE-UP classroom. There are many options for whiteboards: wall-mounted, table-mounted, rolling vertical whiteboards, or portable whiteboards that students place horizontally on their tables. See our recommendation on choosing whiteboards for a detailed discussion of the questions you should ask when choosing whiteboards, the advantages and disadvantages of each type of whiteboard, product suggestions for markers and whiteboards, and the advantages of whiteboards over other collaboration tools. Use laptops rather than desktops. Laptops take up less space so it's easier to see other students across the table, and are easier to move out of the way when students need to work with lab equipment or write on a portable whiteboard. Desktops can work if the tower can fit on the floor rather than on the table, and if the monitors are not too large, or if the monitors are mounted on the wall with D-shaped tables. Have one laptop per group rather than one laptop per student. When a group shares a computer, they are more likely to work collaboratively on the same task. If each student is working on their own computer, they are less likely to talk to each other. 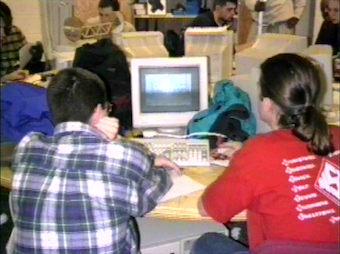 Administrators often want to equip rooms with a computer for each student for reasons other than pedagogy, e.g. so that students can take online assessments in class. If you are stuck with a room with more than one computer per group, it's important to communicate and enforce the classroom norm that each group should use only one computer. One way to do this is to accept only one submission per group for in-class online assignments. Skip the computers if they are too expensive. Even with one laptop per group, computers are often one of the most expensive aspects of building a SCALE-UP classroom. While they are valuable, they are not as valuable as the more basic infrastructure of round tables and whiteboards that encourage a collaborative environment. If the cost of computers is keeping you from building a SCALE-UP classroom, skip them and focus on the cheaper parts of the room. You can implement SCALE-UP without computers, ask students to bring their own, or plan to buy them later when you can find additional funding. Screens: You’ll need at least two ceiling-mounted projectors with projection screens, or LCD screens hooked up to a central computer system, to present material. The screens should be on opposite ends of the room. If you have a screen on only one side of the room, half the students will be facing away from it and will need to turn around to see it, creating more of a sense that there is a "front" of the room. 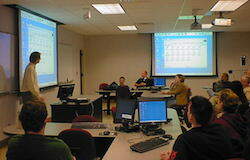 Many newer SCALE-UP classrooms have a wall-mounted screen for each table, that can be used by the students to work together on assignments, or by the instructor to project slides or other content. 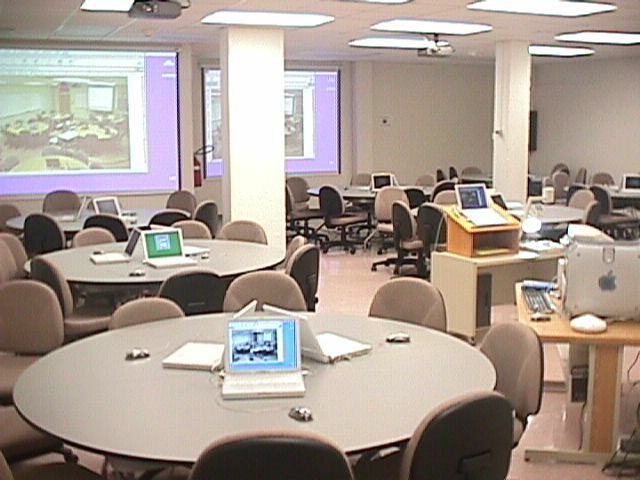 Screen sharing software such as Apple Remote Desktop or ClassSpot allows you to share links and documents with the class, look at all the groups' screens from the podium, zoom in on one group's screens, or project one group's screen around the room so students can present their work to the class. More details about screen sharing are available on the SCALE-UP members only site. 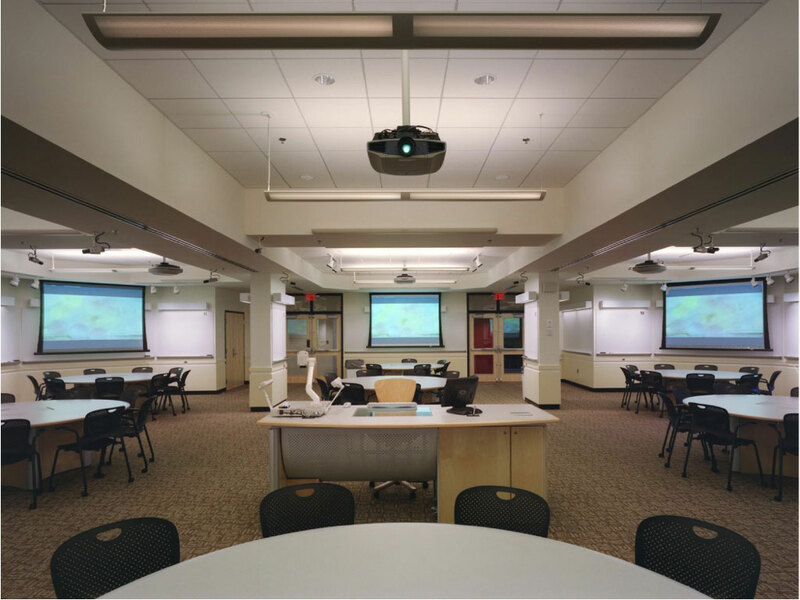 Document cameras: Because SCALE-UP classrooms do not have a front with a large space for demonstrations, document cameras can be useful for showing demonstrations and experiments. Microphones: In a large classroom the instructor should have a microphone to be heard throughout the room. 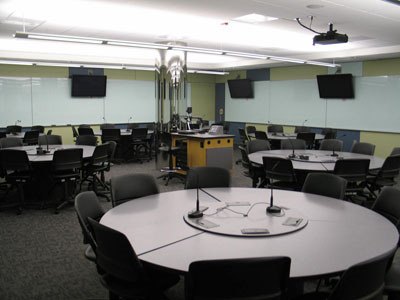 Some SCALE-UP rooms come equipped with microphones at each table so that students can be heard throughout the room during whole-class discussions. Some institutions have rooms with strange shapes, including curved rooms, L-shaped rooms, and long skinny rooms. One institution even had to use two small rooms separated by a doorway, where instructors had to stand in the doorway for all the students to hear them speak. While standing in the doorway certainly helped discourage lecturing, strange room shapes where the students can't all see each other are not ideal for creating a sense that the classroom is a community. 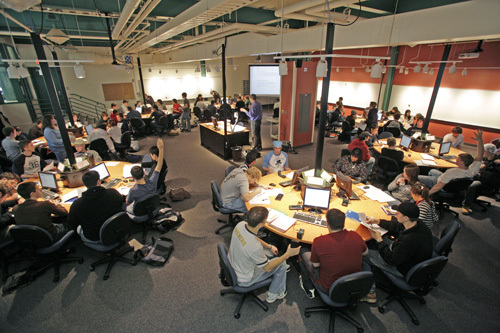 These problems can be alleviated somewhat by putting the instructor podium in the middle of the room, having projectors on walls all around the room, and encouraging students to get up and talk to each other. 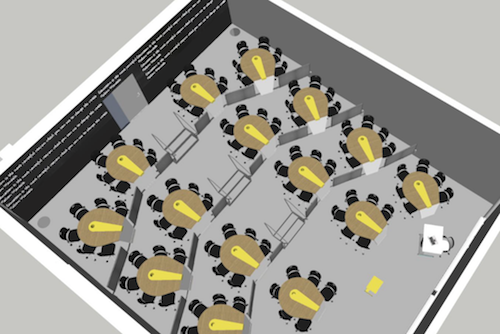 Ideally, however, SCALE-UP classrooms should be shaped so that students anywhere in the room can see anywhere else in the room. Another common problem is having to deal with columns in the middle of the room. University of Minnesota covered theirs with shiny metal and almost made them disappear. Can you find it in the photo below, just to the left of the central teacher station? MIT mounted whiteboards on theirs. American University just worked around them. If possible, supply power via a raised floor or other system that keeps the cords hidden. That isn't always possible, and fire codes usually preclude running cords on the floor, so the only other option is to drop them from the ceiling. This can be done fairly unobtrusively, as can be seen in the pictures below. What you don't want to do is use such a large conduit that you block views/discussions across the table. Not all faculty are ready and willing to give up regular lecturing. 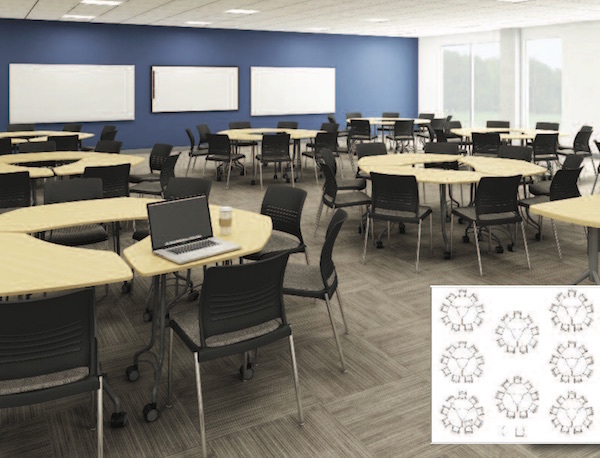 One possibility is to combine trapezoidal tables, either as hexagons seating six, as in the photo from Cornell in the section on hexagonal tables, or larger trapezoids seating nine, as in this photo from San José State University. The tables can always be moved to form straight rows for those faculty preferring the old "tombstone" style. Keep in mind that having options is nice, but there is always a balance between flexibility and optimization.